It was either mighty nice of Apple, or a big marketing gamble, to give everyone in the world a copy of the new U2 album. But not everyone likes U2. Apple has added this album to everyone’s iTunes library, whether you want it or not. The thing is, there are a lot of people who don’t want it. Depending on your iTunes and iOS settings, you may or may not see the U2 album. If you use iTunes Match, or have Show iTunes in the Cloud purchases checked in the Store preferences of iTunes, you’ll see the album. 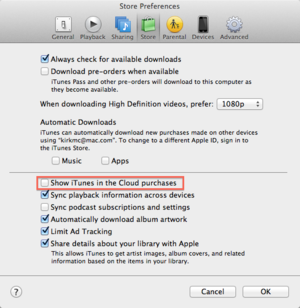 Enable Show iTunes in the Cloud Purchases option to see the U2 album. On an iOS device, it’s similar. If you have iTunes Match turned on, or have enabled Show all Music in the Music settings, you’ll see it. However, if you have those settings turned off you won’t see the U2 album. However, you can hide this album if you so desire. To do this, go to iTunes, then the iTunes Store. (You can’t do this on an iOS device.) One the main page, in the Quick Links section, click Purchased. Next, click the Music button, then Recent Purchases. The U2 album should be near the beginning of the list, unless you’ve bought a lot since Tuesday. Hover your cursor over the album until the X icon displays at the top-left corner, then click it. This hides the album from your Purchased list, and also from your devices, unless you’ve downloaded it. I use this to hide the many free singles and TV episodes I’ve downloaded from the iTunes Store. You can use it to hide the U2 album, but you may also want to clean up what’s in your Purchased list while you’re there. If there’s any music, movies, or TV shows that you bought, or downloaded for free, and don’t want to see any more, just hide them. 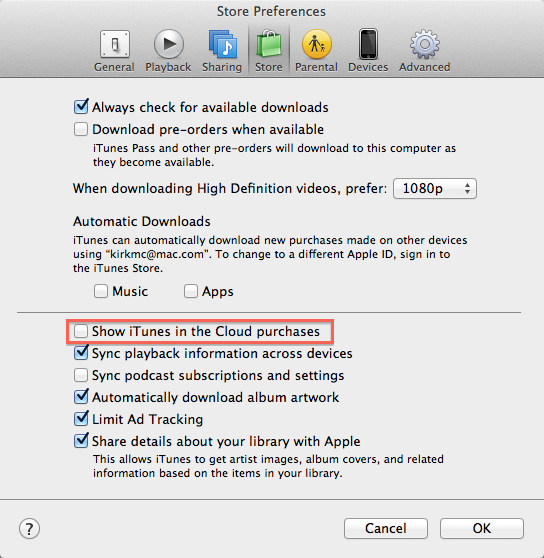 You can unhide hidden purchases from within your iTunes in the Cloud settings. After Hidden Purchases, click Manage. You’ll see a list of all you’ve hidden, with Unhide buttons beneath each item. Click Unhide buttons to reveal hidden content. Click Unhide for any item you want to see again. You may need to toggle Show All Music on your iOS device for this change to take effect, but it should be immediate on iTunes on the Mac or Windows. Note, however, that while you can hide the U2 album—and other purchases—you can never fully delete them. You will always be considered to “own” this album. Even though you never asked for it.